A crown (cap) is a single tooth restoration designed to cover a tooth completely and be permanently cemented. We restore with crowns for a number of reasons. Materials consist of full gold, porcelain fused to metal, and all porcelain. Front teeth are primarily all porcelain crowns. 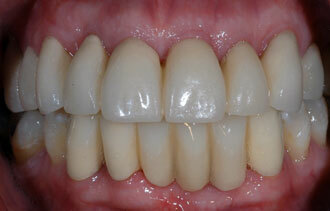 With the new porcelain materials we are able now as dentists to create very natural looking esthetic restorations. At our Daytona dental office, this is usually a two step procedure. The first appointment we prep the teeth to be restored. You then wear the temporary crown for two to three weeks. The final appointment is to try in the crown and make sure it looks good and fits well. When both the patient and the Doctor are satisfied, we cement the crown permanently.